For a smaller city, San Diego does not disappoint when it comes to delicious food. 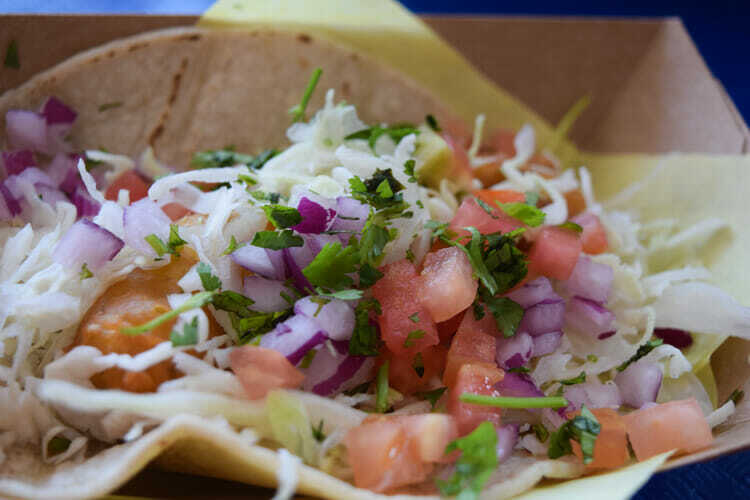 It is known for its fish tacos, along with fresh seafood in all forms, and the best Mexican food north of the border. There’s also a thriving microbrewery scene, authentic Italian food, and a decent array of Asian cuisines. After frequenting the city a handful of times, I’m starting to have my favorite go-to places and so I’ve decided to put a guide together and hopefully help out anyone looking for inspiration on where to eat in San Diego. Quintessential San Diego food moment of our trip: sitting in the mid-afternoon sun on worn wooden tables in front of this taco stand, watching locals drop-by with their surfboards hanging out the back of their trucks to pick up a late lunch and inhaling fresh fish tacos (there was also cactus, carne asada and chicken among us). I could easily relive this moment over and over again. My extensive (read: borderline obsessive) fish taco research brought me to this location in Hillcrest (a lively neighborhood that I grown to love). The fish tacos were light and not overly battered. One taco was pretty filling and made for the perfect in-between lunch and dinner snack. Battling major cabin fever one rainy afternoon, we made a beeline to this spot for some fish tacos. The tacos were hearty with a generous serving of crema and eating them with ocean views in the background more than made up for the lack of sunshine that day. Mustafa and I are creatures of habit when it comes to eating breakfast. When we find a place we like, you will probably find us there again the next morning. This was the case with this french-inspired café, which had a salmon plate that I couldn’t say away from and Mustafa had a mozzarella sandwich that he inhaled in record time. Also, it was never too crowded both days, which definitely beats any half an hour wait for brunch any day. If you’re craving bagels, you cannot find fresher ones than this spot. They also have a huge selection of sandwiches and drinks. I got my necessary lox quota filled when we went there, hold the cream cheese. The signs were mostly in Italian in this corner café that had a wide variety of paninis, including the “salmoncino” that served as the perfect pre-flight fuel. Also, being a big believer in dessert before and after a meal, the chocolate cookie and mint-chocolate gelato were the perfect bookends to my main course. Airport hack: stop by this deli to order a sandwich the size of your arm and split it with your significant other/family member/friend and you’re good to go. We got the turkey and it blew any airport food out of the water. San Diego is famous for its microbreweries and this one has excellent brews and food. Funny side story: we celebrated Mustafa’s birthday here with a bunch of friends from home who happened to be in San Diego during Memorial Day at the same time we were there. It’s the perfect spot to bring large groups, though the service was a bit scattered later in the night when it got busy. We went here to pick up dessert (per my birthday request) and waited for a good 20 minutes. Luckily the cake was worth it and I would recommend dropping by if you are craving something sweet and decedent. Their cakes are the highlight, but they also have pastries and cookies if you’re looking for something less heavy. I was looking for a sushi place to have my birthday dinner at and this restaurant was exactly what I was looking for: a lively interior, fresh ingredients and a reasonable price range. The staff was also very accommodating and made the night that much more memorable. Reservations are highly recommended, since they can get busy during dinnertime. Vietnamese iced coffee, Korean hotteok, and Argentinean empanadas just to name a few of the dinning options at this local Sunday market. The choices were overwhelming in the best way possible and after much deliberation we settled on Turkish borek (savory pastry stuffed with cheese and spinach) and lentil samosas for an epic Sunday brunch.